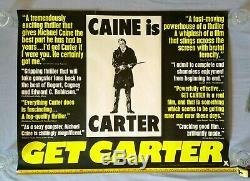 GET CARTER (1971) original U. Poster measures nominal quad size of 30 x 40 inches. This is the'reviews' style quad for the classic 1971 British gangster film. 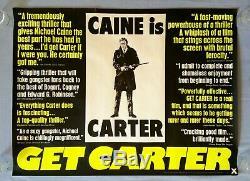 It shows a central image of the shotgun-wielding Michael Caine, with several reviews in white and bright yellow lettering to either side. It is a stunningly impressive poster. And the fact that this poster was never folded, like most quads from the 1970s were, makes it even more unusual and desirable to own. If you already own the standard quad this one will make a fantastic counterpart to it. The poster is in overall very good condition, and displays really well as can be seen. The white areas are generally very clean and colour of the lettering is strikingly vibrant in real-life. As would be expected on any vintage poster there are some light marks and some edge-wear in places. There are three tears on the poster - on the top edge one of approx 2cm and one of 4mm, and one of approx 7mm on the right-side edge. These could be cured by linen-backing. I have taken several photos so that each section of the poster can be viewed in detail. Please see photos for general condition. For rolled posters I use extra strong A0 tubes with 2.5 mm thick walls. For sales outside the U. If you have any questions at all concerning the item please contact me. 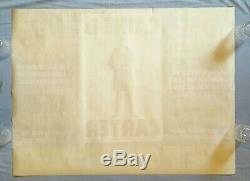 The item "GET CARTER (1971) Original UK quad movie poster ROLLED UNFOLDED -v. Rare -CAINE" is in sale since Friday, March 22, 2019. This item is in the category "DVDs, Films & TV\Film Memorabilia\Posters\Originals - UK Quads\1970s". The seller is "kumosaru" and is located in Brentwood.